What are the uses of Roman numerals? Roman numerals are used for ranking as I, II, III, etc., in writing classroom numbers or expressing the school classes as VI, VII, VIII, IX, X, XI, XII, etc. Often they are used for writing the numbers on clock dials. Children use Roman numerals for recreational purposes. If we write the numbers like IV, VI, IX and XI and place it before a plane mirror, we see the images as VI, IV, XI and IX. Children find that rather interesting. 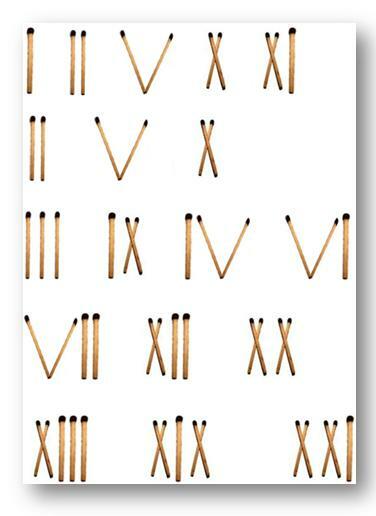 Children take keen interest in forming the Roman numerals with match sticks. On the basis of the above uses of roman numerals facts an educational play may be formed. (ii) the numbers from I to XXXIX, etc.